Here's a few shots of Traction Motors on Locomotives. Traction Motors are built onto the axles of Diesel-Electric locomotives, and receive their power via the main Alternator / Generator connected to the Prime Mover [Diesel Motor]. 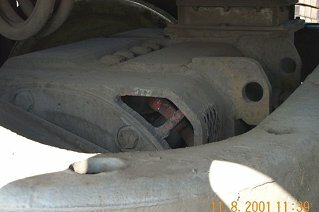 The Diesel Motor is not directly connected to the locomotive's axles - such as how an Automobile's motor will be somewhat directly connected to the drive axle[s] via the transmission and clutch / Torque Converter. Instead, the Prime Mover [Diesel Motor] drives an Electric Generator / Alternator, which in turn creates Electrical power for driving the Traction Motors. This accomplishes a much more secure power transfer method under high torque / high stalled situations - ones where a clutch plate would easilly fry out, or a torque converter would have very little effectiveness. 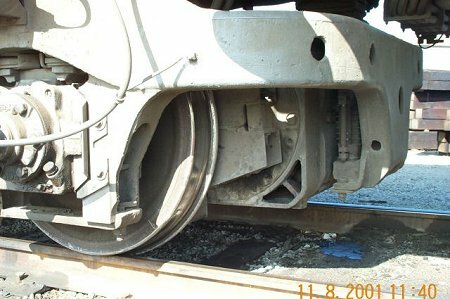 The first two are on the SD40T-2 "Tunnel Motor" unit, shown in the General Discussion area. I'll post more as they become available. Close up of same Traction Motor.